This past December I ran the Baton Rouge Beach Half Marathon and the Ole Man River Half Marathon. To sum it up, I quote Charles Dickens, "It was the best of times, it was the worst of times" (not specifically in that order). Marathon, which annually falls the first Saturday in December. Its a double loop course that starts on the LSU Lakes, travels around the university's campus, through scenic Baton Rouge neighborhoods back to the lake. I planned to do this race as a full marathon (it was my first marathon in December 2008) and anticipated no problems with running that loop twice. Race weekend arrived with temps that warmed up to the mid to high 70's early in the day. Once I was in the middle of the race (roughly mile 4 or 5), I knew that a full marathon would be painful. Having done a full the weekend before and knowing I had other races later in the month, I decided not to push myself too hard. I finished the first loop and decided to enjoy the remainder of the weekend with another half marathon completed. As always, the race was well supported for the size, and the finish line after party featured local touches (alligator gumbo!) that make it a great destination race for runners to come to from across the country. 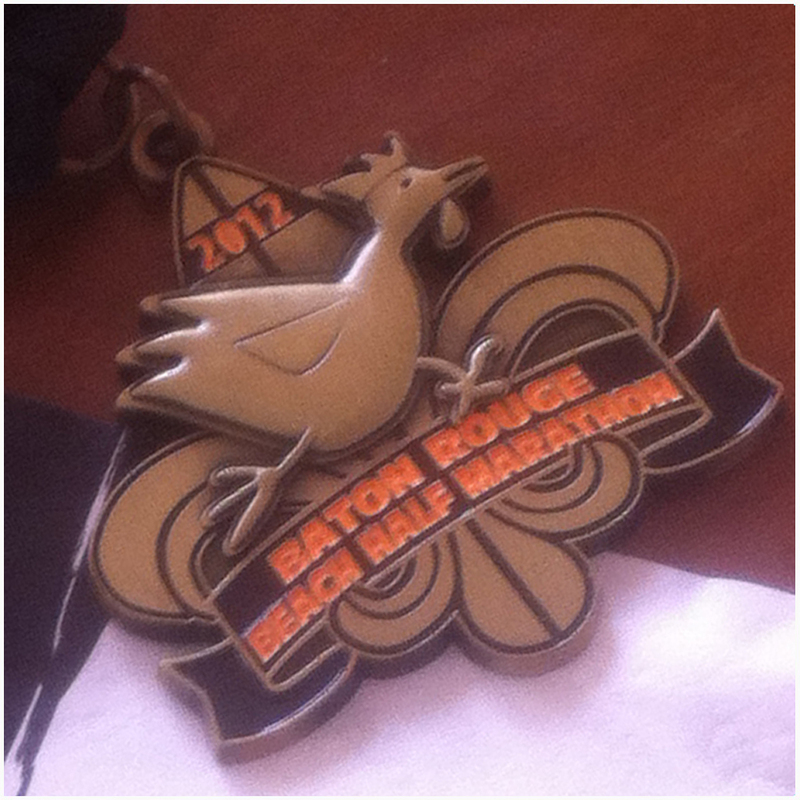 Two weeks after the Baton Rouge Beach adventure, I participated in the New Orleans Track Club's annual Ole Man River Half Marathon. This race was the first half marathon in which I participated (also in December of 2008); however, this year's course changed. For 2012, the course started and ended in City Park and was once again an Out-and-Back, but the middle span was a loop that took runners along Bayou St. John to the shores of Lake Pontchartrain and back to the shade of the oaks of City Park. The temperatures were much cooler this weekend, although the lack of shade on the lakefront made for harsh glare. I felt much better for this race and better rested. The branding for the race had also been updated with new logos and medals, which I am quite excited about. They are well representative of the race locale, and highlight the Louisiana flavor. I was disappointed that I didn't get to knock off another full marathon in December, but that "safe finish" ensured my health to finish the races I planned on executing the remainder of the month and in January. It also set me up to hit the "30 Marathon Mark" at my hometown race in New Orleans in March. I'll continue to run these races in the coming years, and will probably once again see varied success. Races of this distance in South Louisiana are limited, but they are typically executed well when they do occur. They are also usually well attended. That leaves me to wonder, during what time of year would you like to see a distance race occur in South Louisiana and where would you like it to take place? Is there a community and calendar month that you think is under-served with distance races in the New Orleans / Baton Rouge area? To once again quote Mr. Dickens, distance racing in South Louisiana leads me to ask "Please sir, can I have some more?" I would love a half in NOLA between November and January. 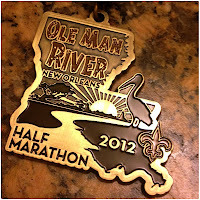 If we could have a race as well-put-together as the Louisiana Marathon, but in our own backyard, that would be great. The key here (for me) would be that it's not in October. I love the Jazz Half and have run twice, but I don't like to gamble with the weather and run long in hotter months. 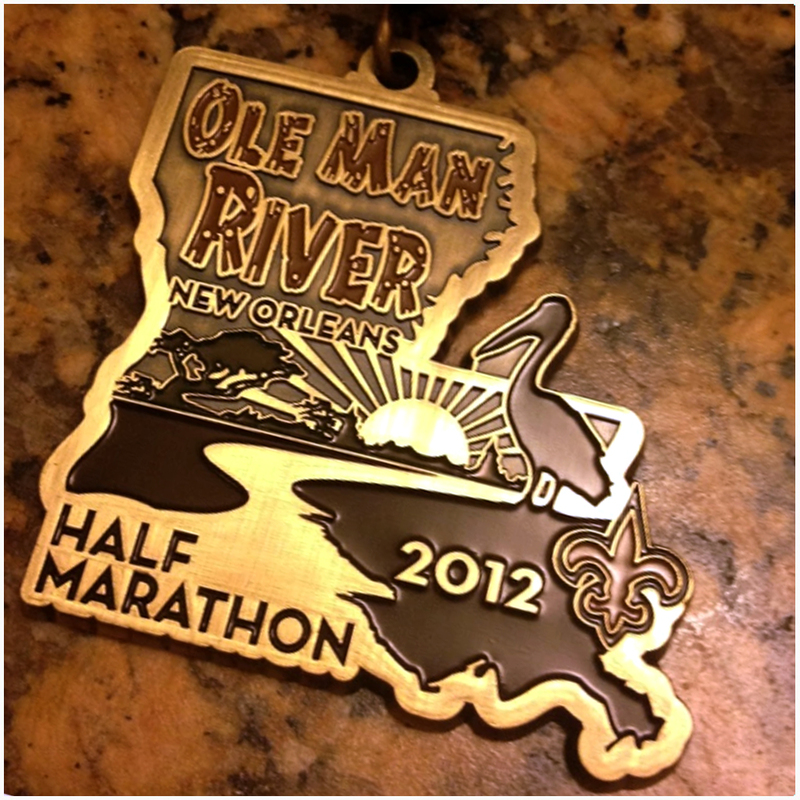 Have you ever run the Ole Man River Half, Katherine? The course is a little mundane (albeit very flat) with the out-and-back, but its usually very cool that second or third Saturday in December. I also agree that a locally run distance race with the quality of the Louisiana Marathon is needed in the NOLA area. The Jazz Half is moved up two weeks this October (as I'm sure you've noticed), so that increases the chances of it being a warm one. I just feel that aside from RnR New Orleans, races in the region are a shot in the dark. Its not a reflection on race organizers, but there's so many outside factors in the ever busy NoLa community that affect events for the better or worse. I haven't run it primarily because I'm not really interested in the course, and I'd heard about issues with the race in years past. I think there's an opportunity for an outside company like the Louisiana Marathon to put on a half here (um, how about a series of races in the state?) or for a local organization to step up its game. I don't need fancier medals or shirts, I just need to know that a race I plan to run is going to be an enjoyable experience in a couple different ways. The IronGirl half that was supposed to take place here a few years back seemed appealing as a women's-only race, and for the fact that the course wasn't the usual St. Charles out-and-back or weaving through City Park, a long run area I've trained in in the past and get bored with quickly. Agreed on the Ole Man River Half course. The 2012 change was an improvement, but still not as dynamic as it could be. Fortunately, The New Orleans Track Club (who puts on the OMR Half) has made some strides in putting on higher quality races and is growing well. I hope that trend continues. My guess (and its strictly a personal guess) is that shutting down public streets with police is cost prohibitive. As of now, the race fees are still fairly reasonable for halves in the region. In order to keep it that way, organizers are using those tried and true out-and-back routes in and around city parks to keep costs low. I had actually signed up to be a pacer in the IronGirl half that failed to launch a couple years ago. I was excited for that one as well, and hope that option comes back for the females in the region. Disney and Nike have made huge strides in Women-focused races, and know there is huge growth opportunities in that market. Any tips for doing two halfs that close apart? Ill be doing Louisiana Half in 2014 & RnRNOLA two weeks apart.. I was tempted to sign up for my 1st Full but I really do like Half's. Not so much time required for training and I can still other smaller races. Honestly Nicole, I always qualify my racing tales with "Do as I say, not as I do." I'm no expert, and a plan of action for these back-to-back races is a personal decision when it comes to figuring out how to handle the training. I've done multiple races on consecutive weekends (including three full marathons back-to-back-to-back), and the only preparation I know that works well for me is standard training on consecutive days with decent mileage. Ultimately, what allows me to participate in distance events close together is what I do on race days. Its all about pacing yourself properly for each race and knowing your limits. You can't run all-out one weekend and expect the same performance the following weekend. Quantity over quality may be the sacrifice you'll have to make.